Home › Ask the Vet › What should I look for in a hoof supplement? What should I look for in a hoof supplement? My eight-year-old Quarter Horse mare competes in western pleasure. I’ve noticed that she’s losing shoes frequently and her hooves are brittle. What should I look for in a hoof supplement? There are two ways to improve hoof quality: from the inside and from the outside. Inside: Begin with good quality hay or pasture and supply the rest of your mare’s daily nutritional needs with fortified grain, a ration balancer or a multi-vitamin/mineral supplement. Because of genetics, location, type of use and other factors, some horses (like yours) may need supplementation beyond their normal diet to grow a healthy hoof. Biotin, Lysine and Methionine, as well as Zinc, Copper and other nutrients have been shown to improve both the growth rate and quality of the hoof wall. Outside: A regular trimming schedule and a consistent environment are crucial to maintaining good, sound feet. Constantly changing from wet to dry to wet may be harder on hooves than an environment that has too much moisture or not enough. 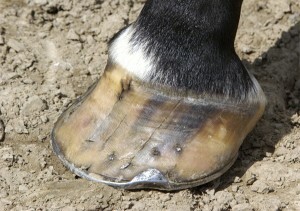 Avoid these situations whenever possible and consider topical hoof products that create a barrier to moisture changes. I have two horses in the same environment, both stabled in seperate stalls that are cleaned out twice daily. The flooring is rubbermats on top of bare ground and several inches of fine sawdust for bedding. The farrier is out every 6 weeks. Hoof and coat supplements are fed everyday. One horse has nice hooves, the other horses’ hooves are horrible. Just two days after being trimmed the hooves look like they have not been touched in several months, even though the horse is on dirt (barefoot). I also apply topical hoof dressing often. It seems I am doing every thing right. I do not know what else to do. I was a farrier for 32 years, what I found worked supper was strieght Neets foot oil on the hood wall and Iodine on the soul for the foot. When these two products are used regularly a horses hoof is so healthy it is difficult to trim the foot because the oil is back into it. When I ssy difficult to trim that is good for the foot because it is a strong hoof. I HAVE A MARE 12 YR. SHE HAS BEEN FOUNDERED AND HER FEET ARE TERRIBLE. I HAVE HER TRIMED EVERY 6 WKS. BUT SHE HURTS ALWAYS. HER HOOVES SPLIT AND BREAK. I CAN`T RIDE HER BECAUSE SHE HURTS.PLEASE TELL ME WHAT I CAN DO TO HELP HER . I have been around with horses and mares and I noticed one of my favorite mares have broken horse shoes more often. Is this actually normal or my mare’s feet need to be trimmed somehow? The only hoof supplement that I’ve used that I saw a difference is SmartPak’s Smarthoof Ultra. My horses feet look great now. They used to break up around the nails. I have a mammoth donkey with brittle hooves which were always a mess. I have switched him to a low starch pelleted feed, and his feet don’t look like they belong to the same donkey. It’s been six weeks since the farrier and hardly any cracks. I didn’t know what to look for in a hoof supplements so I have been very grateful for this post!